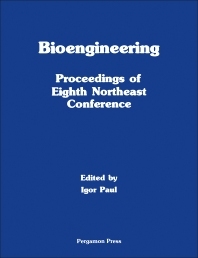 Bioengineering: Proceedings of the Eighth Northeast Conference focuses on the discussion of scientific programs, methodologies, experiments, and contributions to the advancement of bioengineering, such as in the field of medicine. The book is composed of literature of various authors who have worked diligently in the field of bioengineering. The text starts by discussing the conditions, situations, and experiments on how the human bones and other internal organs react if subjected to stress, fatigue, and other factors. The properties, composition, and reactions of these body parts to different conditions are discussed. Experiments on regional tissue blood flow through hydrogen clearance and on minimizing the effect of gas trapping on static pressure-volume curves of excised lungs are also presented. The book also notes the instrumentation and control systems for clinical vestibular and cardiovascular stress testing. A large part of the selection deals with research on different internal body parts when subjected to different conditions. Supporting these discussions are control measures, findings, suggestions, methodologies, numerical representations, and recommendations. The book is valuable to scholars, researchers, and readers who are interested in the field of bioengineering. This Session Has Been Combined with Others.